Aspect ratio: Images should be kept to a 4:1 aspect ratio. This means that the width of the image should not be more than 4x the height. Images outside of this aspect ratio may look distorted, stretched or pixalated. Image resolution: Images should conform to the minimum and maximum resolutions as noted below. These fall in line with the 4:1 aspect ratio. Navigate to your course by choosing it from the My Courses drop-down or by searching for it. If there is an image already in the course summary files box you may need to delete it before uploading an image again. This can be done by clicking on the image and selecting the delete button. Select Upload a file and click the Attachment button to browse for the image. 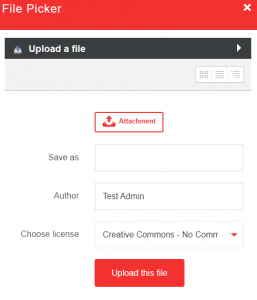 Once you upload the image, select the relevant license type and click the Upload this file button. Final step, scroll to the bottom and click Save and display. You may also want to add a course summary.